Hi friends! 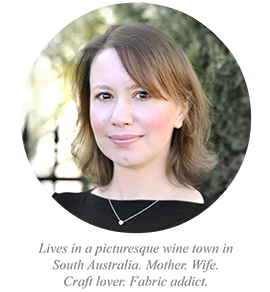 Hope you all had a great Christmas with your nearest and dearest, and enjoying a happy and relaxing holiday week. Christmas was such a lovely day at our home - I made our first Christmas ham (with maple syrup and orange glaze - yummm). It came out of the oven looking so scrumptious and we were all so very hungry that I completely forgot to take a photo!! It was incredibly delicious, even if I say so myself. On Boxing Day we were joined by friends and their kids for a 'left-overs' party. It was a pretty hot day (34C) so we set up gazebos by the pool side, playing water games, cooking sausages on the barbie, and enjoying ice cold drinks. Great times. Now for some selfish sewing! 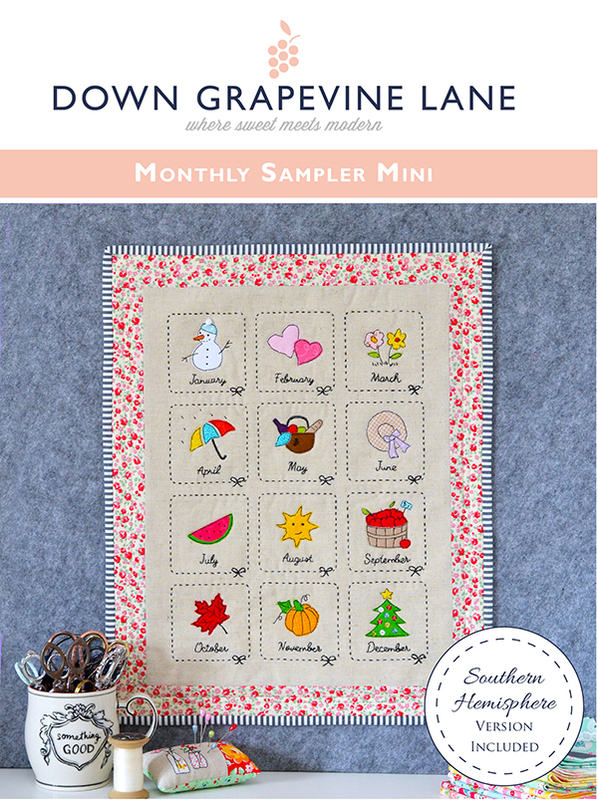 This year has been a really great year for me and Down Grapevine Lane - I’ve been so busy on the ‘business’ side of things - illustrating two new fabric lines, working on my new book, launching my quilt pattern series, sewing magazine commissions, collaborations, and so on and so forth. But a few weeks ago I realised I don’t sew for pleasure anymore! And the never ending quest to come up with something ‘original’. You know what? I just made this simple square patchwork scrappy cushion 'just because' - and it felt so good! I wavy quilted the cushion front in Aurifil Pink 2410 (50wt), added a sweet little Zakka tag, and bound with bias gingham. So pleased with how it looks on my sofa in our living room. 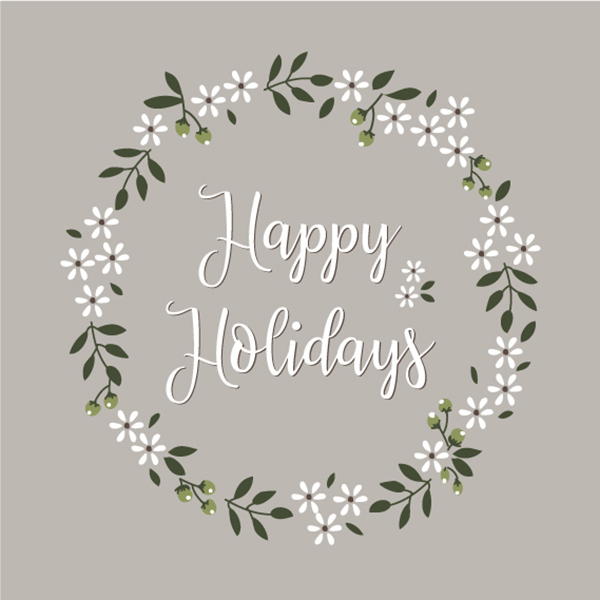 Wishing you all a lovely holiday season and happy and healthy new year in 2018. The wreath in this image is a free embroidery pattern from my Tutorials section - you can download it here. Happy Holidays! Hi friends - it's almost time for Christmas, are you getting excited? As the countdown to the big day begins, I managed to squeeze in two final quilt patterns just before the holiday season kicks off. Both of these quilts have been sitting in my 'to publish' pile for some time - those who follow me on my social media will most likely recognise them. 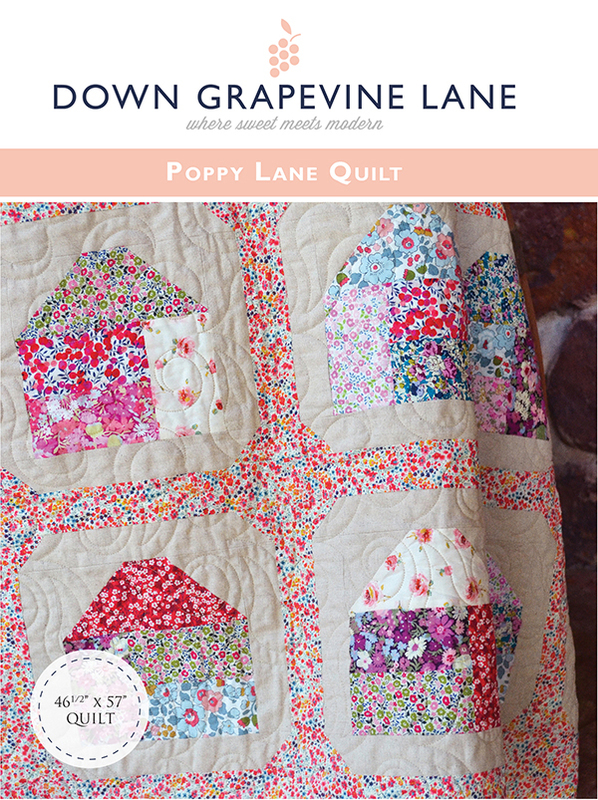 So I present to you 'Poppy Lane', which is a large throw size quilt, and 'Monthly Sampler', a sweet little mini quilt to hone your appliqué and hand embroidery skills. 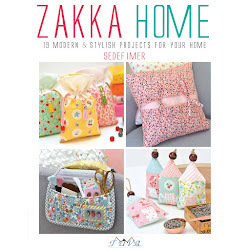 Both of these patterns were launched at the Australian Quilt Market recently and are available for wholesale order via Creative Abundance and Checker distributors. 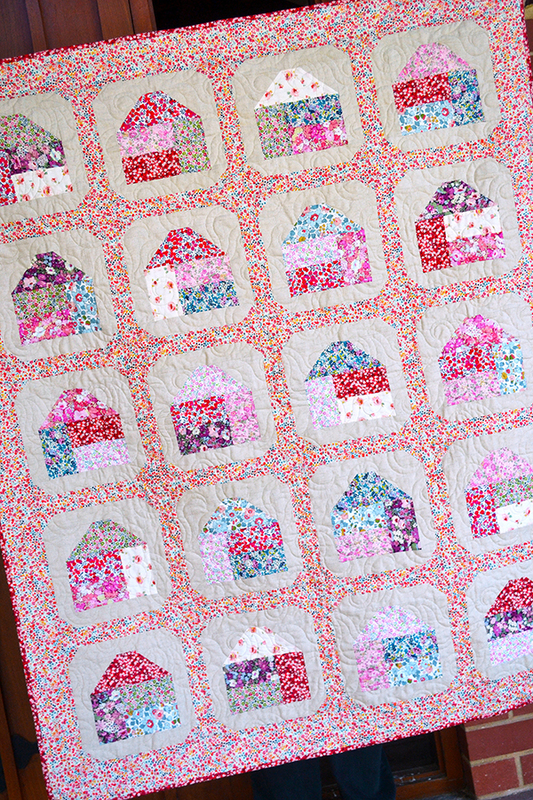 My first pattern 'Poppy Lane' is a large throw size quilt depicting cute floral cottages lined up in rows - the fabrics I used are Liberty of London tana lawn florals paired with Essex linen in natural. 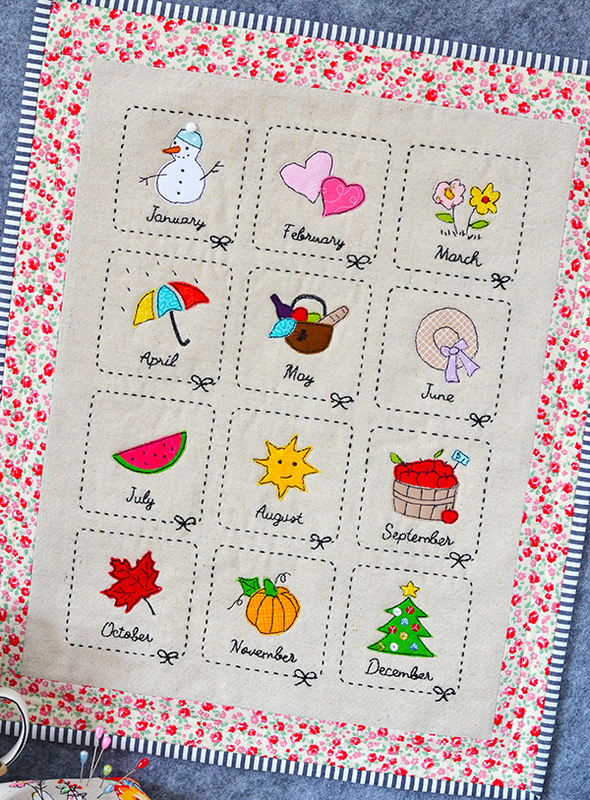 It's simple and quick to piece, and suitable for all levels of quilters. 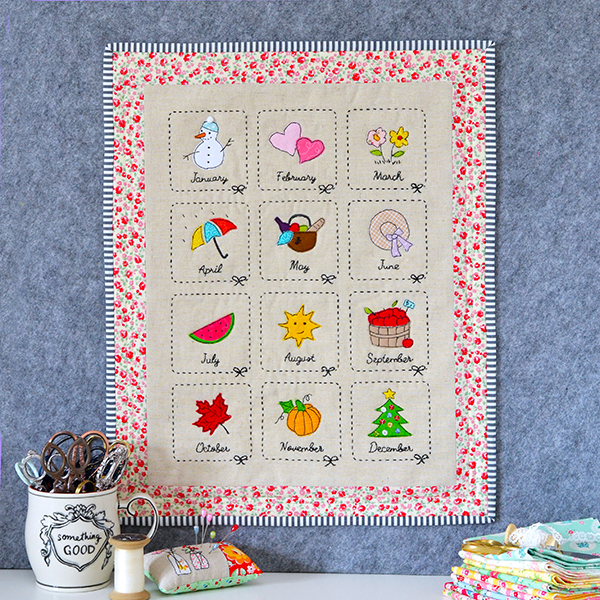 My second new pattern is a sweet appliqué and embroidery wall hanging, including templates for both Northern and Southern hemispheres. It's best suited for intermediate and advanced sewists - it may be a bit of a stretch for those who have no appliqué and embroidery experience, though I personally never let that put me off. Always the deep end, that's my personal sewing motto! You can purchase these patterns from my Etsy shop (see below links). Or ask your local quilt store to order them in! Thanks for visiting. Time to get back to sewing a few more presents before the fat man in red arrives! It's that time of year again - end of the school year here in Australia and Christmas is just around the corner. Which means... time to make some teacher gifts! Last year I made some amaretti cookies for the kids' teachers and they were so popular I decided to do the same again this year. 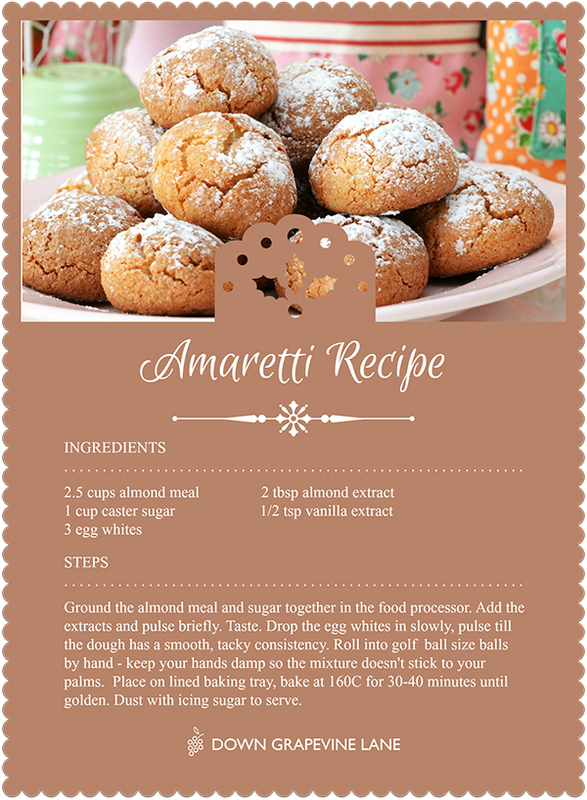 For those of you who haven't come across them before - Amaretti are Italian almond cookies, similar to French macaroons in flavour. Intensely almondy, crunchy on the outside and chewy in the middle. Gluten and dairy free too! If you can't find almond meal or almond flour at your supermarket just get a bag of natural almonds (skins on, unroasted) and grind them up in the food processor. 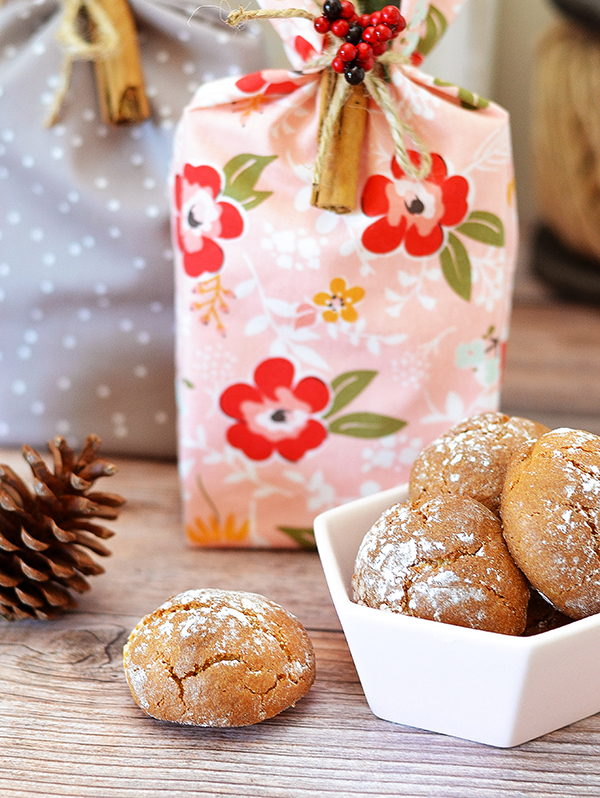 Don't skip the almond extract in this recipe - it is the most crucial ingredient that gives the cookies that intense almond taste. Also a tip - I always make a double batch when I bake these (just double the ingredients) as they are so moreish, and one batch lasts about 10 minutes in our house. Ha! I put the cookies into small cardboard party treat bags (you can also use mini noodle boxes) and then popped them into these super quick pouches I whipped up. The fabrics are all from my Sweet Prairie collection for Riley Blake Designs. I also added some necklaces and brooches I made using these cute stitchery frames my pattern distributors Creative Abundance sell - contact them for retail stockists. 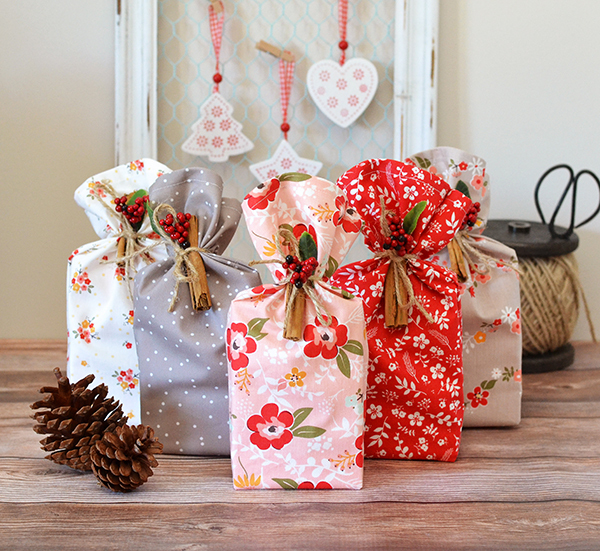 These pouches are so sweet and really take just 5 minutes to make. I first measured the party treat bags I was using (which are 4" x 6" and about 2" deep) which determined the size of the pouch - mine measure ~6" at the bottom and ~11" tall finished. 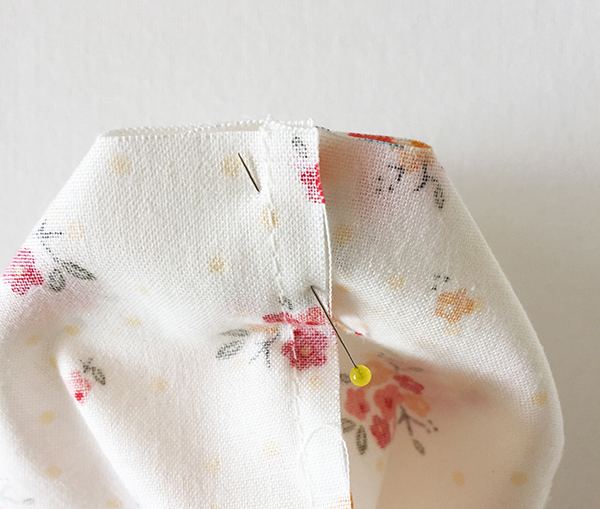 You can adjust the size of your bag very easily by just cutting bigger or smaller fabric in the first step of the tutorial below. 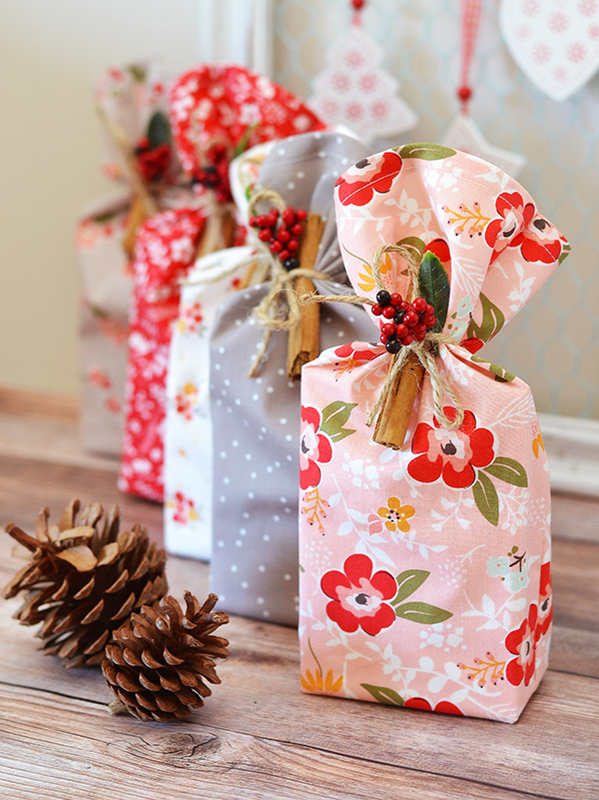 It's completely flexible - you can even make large Santa sacks! 1. Cut two pieces of fabric, measuring 6" x 12" (adjust this size depending on your requirements). 2. Fold one short edge of one of the pieces of fabric in by 1/2", wrong sides together. Press. Fold in again by another 1/2" and press. I didn't get overly precise here, I just eyeballed roughly 1/2" width of fabric before folding and pressing. You can use a ruler and mark lines for your folds if you wish. Top stitch along the folded edge, about 2mm away from the edge. Repeat for the other piece of fabric. 3. 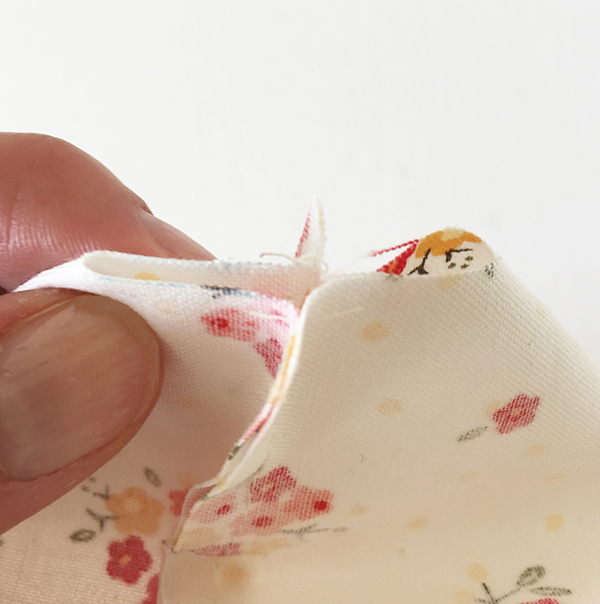 Place the two pieces of hemmed fabric right sides together, making sure the top (hemmed) edges are up against each other. Pin together in several places near the edges. Starting along the top right edge sew a 1/4" seam all the way around three sides of the pouch until you get to the top of the pouch again. Secure your beginning and end stitches well. Mark a 1" square on the two bottom corners and cut these out with scissors. 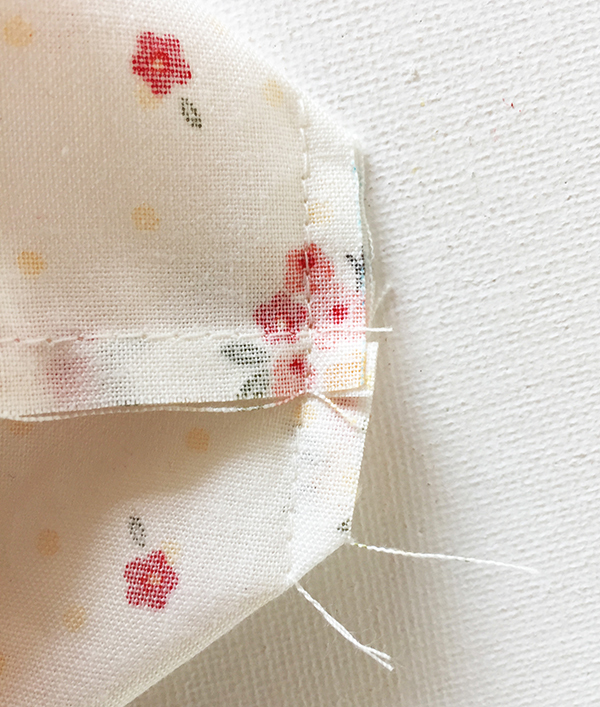 (Tip: Don't worry about the fact that the seam may unravel when you cut the stitches - we will secure that seam in the next step). 4. This is the trickiest step so I included a few photos to show what you need to do here. We will now make a 'box bottom' for our pouch so it sits better on a flat surface. Where you cut one of the 1" holes, put your finger into the hole and open it up, then pinch the fabric in the other direction until the two seams meet. Using your fingers fold the seams in opposite directions (one to the left and one to the right), making sure they snugly nest in the middle. Pin across both seams. Sew a straight 1/4" seam accross as shown. Repeat for the other hole. 5. Turn the pouch inside out, push the corners out with a pointy blunt object (like a chopstick), and press if the fabric got too wrinkly (I didn't bother). 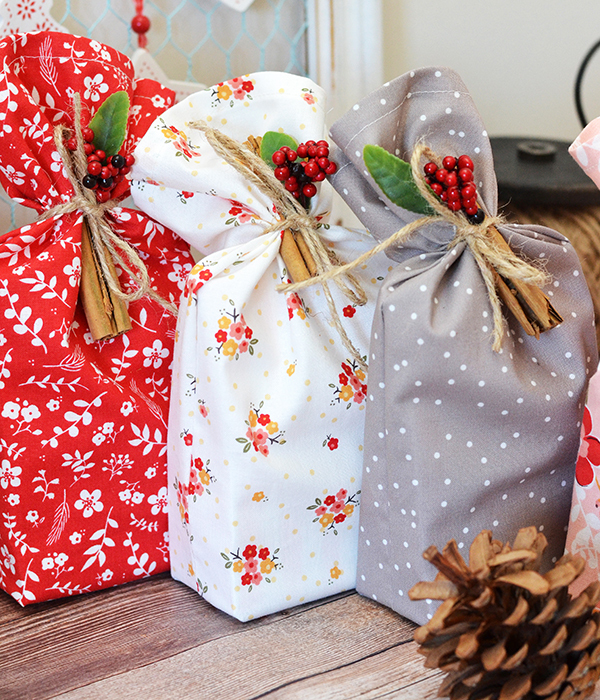 Pop your goodies in, tie it up with some string and add festive decorations as desired! 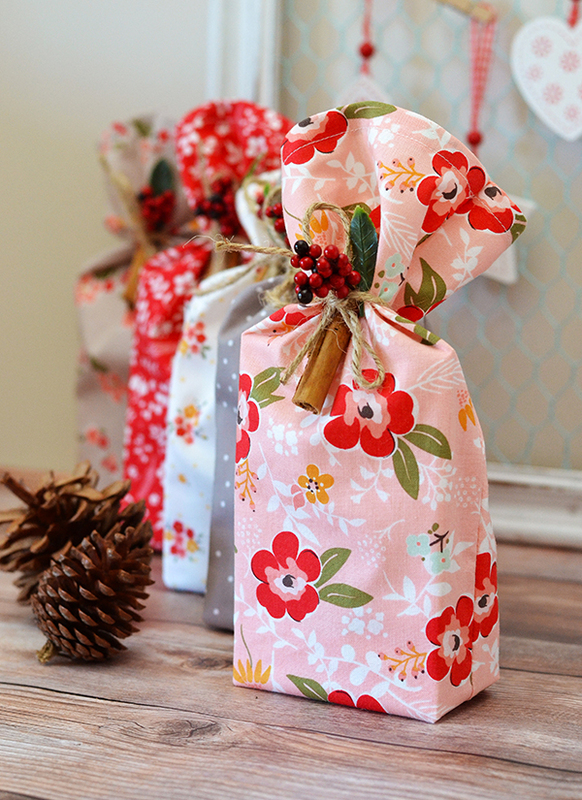 Hope you enjoyed this quick tutorial and will be making these handy pouches for some festive treats!